The agency needs at least 25 travel nursing recruiters. 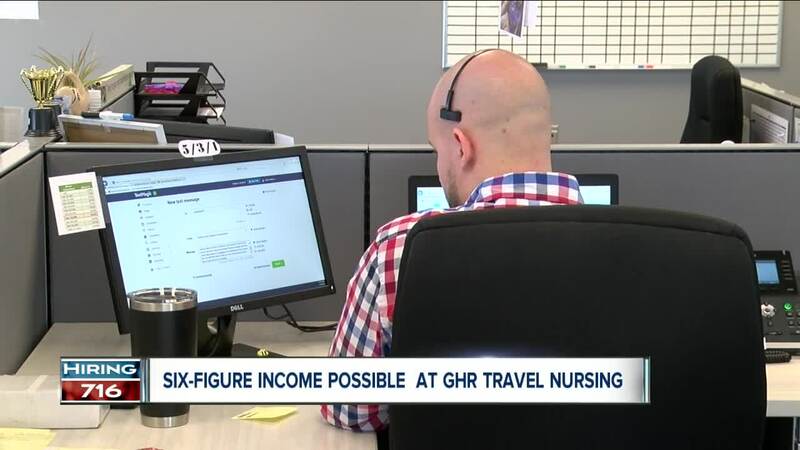 Inside GHR Travel Nursing in Cheektowaga, the stakes are high. Recruiters are tasked with finding qualified nurses for health care facilities nationwide. “We put travel nurses to work. So, we take nurses from Boise, and bring them to Buffalo,” said Company President Cheryl Wilhelm. The agency is currently looking for 25 to 30 more recruiters. One of the things the office likes to do is share in each others success. So, when a recruiter signs on a new nurse, they ring a bell, and everyone celebrates. “What we do is so important. We're putting people to work who are taking care of patients, so we want to find the right match and person. So, we make the culture here very fun,” said Wilhelm. Positions start at $35,000 a year, and that's not including bonuses. “Achieving six-figures is not unrealistic,” said Recruiter, Stewart Betteridge. The agency typically looks for college graduates with prior work experience. But neither qualification is required. Wilhelm said it can also be about an applicant's personality and drive.